Of all plant behaviors, ectopic embryogenesis (reviewed in Radoeva and Weijers, 2014) might be one of the coolest. Zygotic embryogenesis begins with fertilization, followed by an asymmetric cell division that generates two cells with distinct fates. The small apical cell gives rise to the pro-embryo, which develops into (most of) the plant body. The larger basal cell divides and forms the suspensor, which tethers the growing embryo to the endosperm and generates part of the root. Although the suspensor is fully developed (and mitotically quiet) by the globular stage of embryogenesis, in some species, it becomes activated and forms an embryo when the pro-embryo isn’t up to the task due to damage, mutation, or blocked auxin signaling. Ectopic embryogenesis occurs in Arabidopsis thaliana, an excellent model system for studying how the suspensor-to-embryo transition is suppressed and unleashed. A large regulatory network converging on a group of embryo-specific genes is thought to promote embryogenesis and/or suppress embryo identity in suspensor cells. However, while several genes that trigger this transition have been identified, if/how they interact in such a network is unclear. Genome-wide transcriptomic analysis provided Radoeva et al. (2018) with a glimpse of the network controlling the suspensor-to-embryo transition. 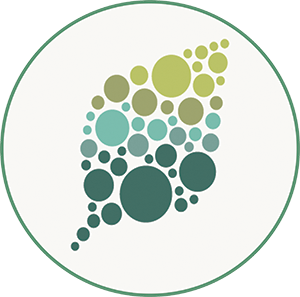 As a starting point, they focused on the auxin response, a key pathway suppressing embryo identity in suspensor cells (Rademacher et al., 2012). In the absence of auxin, AUXIN RESPONSE FACTORs (ARFs) bind to Aux/IAA repressors, preventing the ARFs from regulating auxin-responsive gene expression. Auxin degrades these repressors, allowing the ARFs to regulate their targets. The Aux/IAA protein in the gain-of-function bdl mutant is not degraded by auxin. To explore the transcriptional changes associated with the suspensor-to-embryo transition, the authors crossed bdl plants with the suspensor-specific driver line M0171. M0171>>bdl suspensor cells proliferated instead of remaining quiescent. Microarray analysis of M0171>>bdl vs. control embryos isolated well before the transition revealed numerous misregulated genes in the mutant, indicating that the induction of suspensor cell proliferation and embryogenesis is associated with massive transcriptional reprogramming. The misregulated genes include members of multiple gene families involved in auxin homeostasis. The reduced auxin response in M0171>>bdl appears to trigger increased auxin biosynthesis and decreased auxin transport. Although the auxin response is absent in M0171>>bdl embryos up to the heart stage, it recovers during the torpedo stage, highlighting the robustness of the system. The authors generated promoter-reporter lines to assess the expression domains of the 68 most highly misregulated genes. 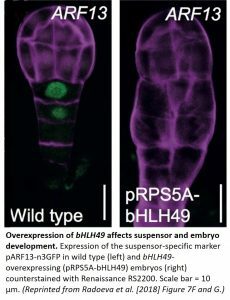 Of the genes upregulated in embryo cells or downregulated in suspensor cells, four bHLH genes (bHLH49, 60, 63, and 100) were chosen as potential regulators of suspensor proliferation, as several bHLH transcription factors mediate auxin-dependent development. These genes were expressed in the expected cell types, and the associated T-DNA insertional mutants showed suspensor-specific embryo defects. The phenotypes of bhlh49-1 and bhlh100-1 were especially exciting, with proliferative divisions at the suspensor-embryo junction. Plants overexpressing bHLH49 had dividing embryo-like suspensor cells lacking a suspensor-specific marker (see figure). The sets of misregulated genes in bHLH49 mutant and overexpression plants vs. M0171>>bdl embryos strongly overlap. Therefore, bHLH49 likely functions in a bHLH transcriptional module that suppresses or triggers ectopic embryo formation from suspensor cells, but only when the time is right. Rademacher, E.H., Lokerse, A.S., Schlereth, A., Llavata-Peris, C.I., Bayer, M., Kientz, M., Freire Rios, A., Borst, J.W., Lukowitz, W., Jurgens, G. and Weijers, D. (2012). Different auxin response machineries control distinct cell fates in the early plant embryo. Dev. Cell 22: 211–222. Radoeva, T., Lokerse, A.S., Llavata-Peris, C.I., Wendrich, J.R., Xiang, D., Liao, C.-Y., Vlaar, L., Boekschoten, M., Hooiveld, G., Datla, R., and Weijers, D. (2018). A robust auxin response network controls embryo and suspensor development through a bHLH transcriptional module. Plant Cell 30: doi:10.1015/tpc18.00518. Radoeva, T. and Weijers, D. (2014). A roadmap to embryo identity in plants. Trends Plant Sci. 19: 709–716.